Very Good. Killing Jesus: A History (Bill O'Reilly's Killing) by O'Reilly, Bill, 2018-02-27. Mass market (rack) paperback. Glued binding. 336 p. Bill O'Reilly's Killing. Good. Killing Jesus: A History (Bill O'Reilly's Killing) by O'Reilly, Bill, 2018-02-27. Mass market (rack) paperback. Glued binding. 336 p. Bill O'Reilly's Killing. Good. [ No Hassle 30 Day Returns ] [ Edition: Reprint ] Publisher: St. Martin's Paperbacks Pub Date: 2/27/2018 Binding: Mass Market Paperback Pages: 336. Good. Buy with confidence! Comes with our 100% money back guarantee! ! Tracking included with every order! ! ! The cover is clean but does show some wear....The cover has curled corners....The pages are nice and crisp! This was a very disappointing book. 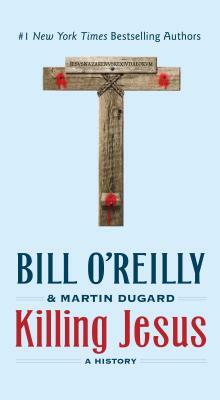 O'Reilly has made a big point to say that this is not a theological book; it is history. Yet there is a lot of theology in it. From the discussion of Jesus' siblings to the Roman Catholic view about the assumption of Mary, it's really filled with a lot of Roman Catholic doctrine. And the history really isn't that accurate. From the first page to nearly the last, the authors have made clear that Jesus was 36 when he died. Not true. He was 33. The Bible never says how old Jesus was when he died, but it's not hard to figure out. He was 30 when he began his ministry (Luke 3:23). When you look at all the events in the Gospels including all Jesus' visits to Jerusalem for Passover, it's clear that his ministry lasted about 3 years. Even the authors admit as much when then talk about the second Temple cleansing on p. 192. They say it was 3 years from the first time Jesus did that. True, so where do you get 36? There are a lot of things I really wonder about. Why the big discussion in chapters 2 and 3 about Julius Caesar? What did he have to do with Jesus? This is supposed to be about Killing Jesus, not Killing Caesar. I would also like to know why the cross on the cover is a nonstandard type of cross. That is never mentioned in the book. I've heard Bill say on his program that he and Dugard believe that's what it looked like. Okay, how about some evidence? And if that's true, why do crosses look the way they do now? They've looked like the typical cross for a long time too. I cannot recommend this book. I would recommend that people read about Jesus in the Gospels: Matthew, Mark, Luke, and John. They deal in facts. Not speculation.